Holy Yak! 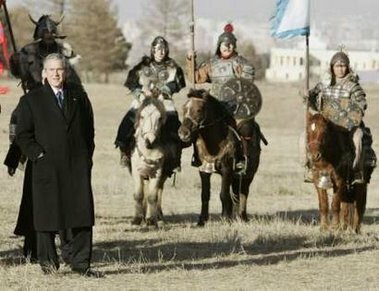 Bush praises the “Fearless Warriors” of Mongolia. George W Bush has become the first sitting US president to visit Mongolia.In a show of support for a fledgling democracy that has sent troops to Iraq and Afghanistan, Mr Bush said US forces were proud to fight alongside the “fearless warriors” of Mongolia.In his speech, Mr Bush expressed strong support for Mongolia’s young democracy, encouraged more economic reforms, and pledged to hammer out a US aid package. 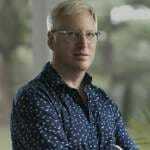 He said: “You are an example of success for this region and the world. Bush also thanked the country for sending more than 100 soldiers to support US forces in Iraq and roughly half that number to bolster international efforts in Afghanistan. The US has said it is providing Mongolia with £10m of military aid this year to train Mongolian officers at US military schools, for equipment and to refurbish an old Soviet-era training area. 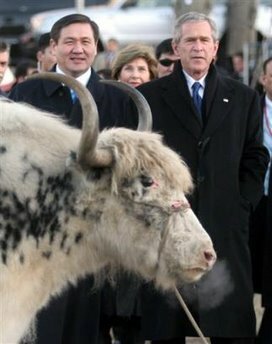 Mongolia has been a staunch ally of the US in the War on Terror. President George W. Bush and President Nambaryn Enkhbayar today reaffirmed the longstanding friendship between the United States of America and Mongolia and committed to defining guiding principles and expanding the framework of the comprehensive partnership between their two democratic countries based on shared values and common strategic interests, as declared in the Joint Presidential Statement of July 15, 2004. On behalf of the American people, President Bush expressed his appreciation for the outpouring of sympathy and generous financial assistance from the government and people of Mongolia for the victims of Hurricane Katrina. 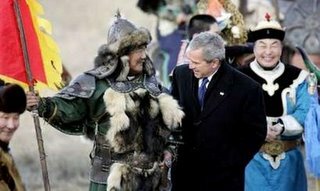 President Bush welcomed Mongolia’s progress toward becoming a mature and stable democracy, which observes human rights and civil liberties, and a private sector-led free market economy. 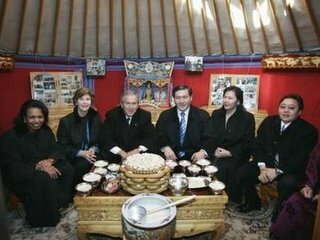 He congratulated the people of Mongolia, on behalf of the American people, for qualifying for eligibility for the Millennium Challenge Account, and looked forward to the successful conclusion of a Compact that will reduce poverty through economic growth and reflect the Government of Mongolia’s commitment to continued political and economic reform. This “Longhorn” ain’t from Texas! George Lewis, correspondent for NBC News is there now in advance of Bush’s visit, and he’s pretty astonished that Mongolia isn’t a failing state in which people surpress their women, loathe America, and wish to be secluded from the rest of the world. Surprise! Publius Pundit has been following the historic year in Mongolia. Nathan, the Central Asian expert at the Registan also has terrific links on the president’s historic visit to Mongolia.